The Driver Or Traveler Or Tourist Is Driving A Car. 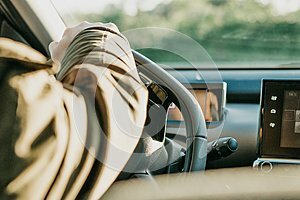 Photo title: The driver or traveler or tourist is driving a car. Close-up. The driver`s hand on the steering wheel. The driver or traveler or tourist is driving a car. Everyday riding or traveling.